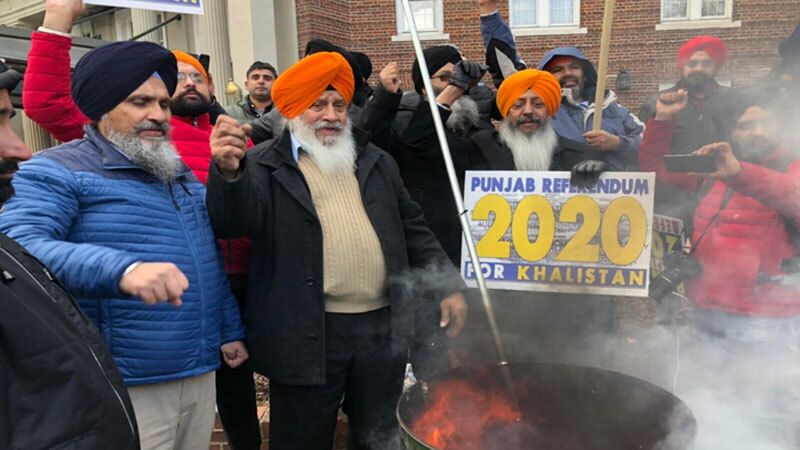 On the 70th Constitution Day of India, US based Sikh advocacy group burnt India’s flag in Washington DC to protest against labelling of Sikhs as “Hindu” under the Indian Constitution and demanded secession of Indian held Punjab to establish independent country “Khalistan”. On January 26, 1950, Constitution of India was promulgated which, in Article 25(b), classifies people of Sikh religion as “Hindus” and subjects the Sikh community to the personal, matrimonial and family laws of Hindu religion. While Harsh Vardhan Shringla, India’s Ambassador to United States hoisted the Indian flag in Washington DC to celebrate the Republic Day, hundreds of Sikh separatists set ablaze Indian Tri Color and chanted slogans “Sikhs Are Not Hindus” and “Free Punjab – End Indian Occupation”. “To suppress the Sikhs’ demand to abolish Article 25(b) of the constitution, India committed genocide of Sikhs in June and November 1984 and in extra judicial killings in the following decade”, stated attorney Gurpatwant Singh Pannun legal advisor to “Sikhs For Justice” (SFJ). “The only solution for the Sikh community to preserve their religious identity is the establishment of Indian held Punjab as an independent country”, added attorney Pannun. On the occasion, Indian Embassy also arranged a rally at the same spot, challenged Sikh protestors and chanted slogans in favor of India, called protesting Sikhs as terrorists and traitors. Huge number of D.C Police already deployed there managed to keep both the groups separated. Sikhism is the World’s 5th largest religion with more than 28 million followers and is recognized as a separate religion throughout the world except India, said one of the Sikh, chanting slogans against India. “Article 25(b) of the Indian constitution shows that India’s claims to secularism and democracy are sham”, stated Dr. Bakhshish Singh Sandhu, President of Washington based Council of Khalistan. “Sikhs For Justice” (SFJ) is an international human rights advocacy group which is spearheading Referendum 2020 (www.referendum2020.org) campaign to realize the right of self-determination for Sikh people on the basis of the principle enshrined in UN Charter and International Covenant on Civil and Political Rights (ICCPR). According to SFJ, “Under UN laws, Sikhs qualify as “people” on the basis of their separate religious identity; cultural heritage and a distinct language – Punjabi and a historical homeland – the Indian held Punjab”.